SK Telecom will provide an asset management service by using blockchain technologies within this year, and build a platform that will help match blockchain startups with investors for growth of the techs and related industry, the mobile carrier’s blockchain unit head said Tuesday. 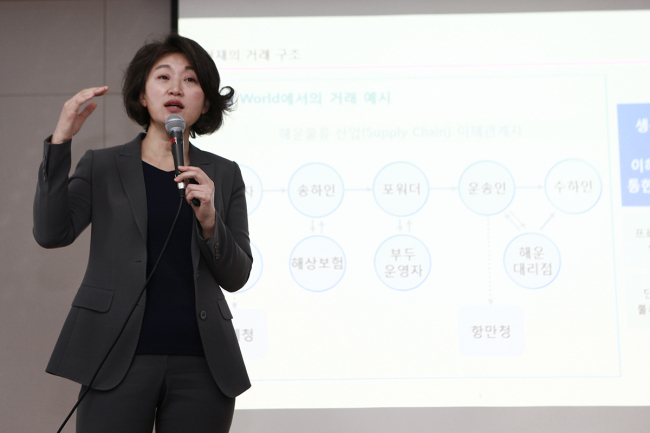 Oh Se-hyeon, executive vice president of SKT’s blockchain business unit, said the company is planning to launch a blockchain-based asset management and payment service, which will ensure trust for peer-to-peer transactions. By applying blockchain techs, history of past transactions of one’s assets -- including real estates, diamonds and raw materials -- will be verifiable and raise transparency of transactions. “The way of transacting assets will be innovatively different with the blockchain techs,” she said. SKT will also launch a platform named “Token Exchange Hub” that will boost transparent financial transactions by startups and small and medium-size enterprises by supporting initial coin offering. “SKT will provide systematic administrative supports for startups to issue bitcoins in a more transparent and safe manner through the platform,” Oh said. The mobile carrier will not issue virtual coins or engage in ICO, but offer technological and financial consultations for startups. “We will provide consistent supports for companies that will do businesses using blockchain technologies and help create a blockchain ecosystem,“ she added.